The base salary for all rank-and-file members of Congress is $174,000, more than triple the median household income of the United States. In exchange for that generous salary, members of Congress work one out of three days. The House of Representatives was in session for only 18 hours a week in 2013. Members worked only 130 days in 2015. In case you needed more evidence that Congress doesn’t earn its salary, consider this: House and Senate members only worked eight days in April. Eight work days in a month, with an annual salary of $174,000. Can you imagine? Must be nice! Meanwhile, in the real world, the average American worker puts in more hours than a medieval peasant. Full-time U.S. employees use only 54 percent of their paid vacation days, sacrificing the rest for fear of falling behind or being replaced. The idea of a congressman skipping that much vacation is laughable, at best. I was raised to believe that how people spend their time is a direct reflection of their priorities. The United States holds more than $19 trillion in debt, not including unfunded liabilities. Our health care, immigration, and justice systems are in desperate need of reform. Public schools are underperforming, while families and small businesses are being taxed out of financial security. Where is our elected leadership? Clearly, they have other priorities. Members of Congress spend most of their time in their districts, schmoozing with donors, speaking at private events, and securing their next elections. The average House member spent $53,170 of taxpayer money on travel in 2013. These aren’t legislators, these are professional campaigners. The fix is in. Congressional Democrats have no legislative agenda to run on for the 2018 midterm elections, so they’ve made a hobby out of Republican witch-hunts instead. The fix is in. Did you know, the four richest counties in the United States (and nine of the top 20) are all suburbs of Washington, D.C.? Loudoun County, Virginia takes the #1 spot with a median household income of $125,900. That is more than double the median household income for the entire country. The Weekly Fix: Democrats Hate Fake News. Except When They Do It. The fix is in. Democrats hate fake news, unless it’s created to elect congressional Democrats. The fix is in. Democrats finally manufactured enough outrage to force Environmental Protection Agency Administrator Scott Pruitt to resign. Pruitt’s resignation had nothing to do with his job performance. In fact, his legacy of regulatory reform will continue to have long-lasting benefits for small businesses and hard-working American families. The fix is in. During an interview for a documentary series titled, The Swamp, Congressman Thomas Massie (R-KY) revealed that Republican members of Congress must “pay rent” for revered legislative committee positions. The Weekly Fix: Putting a Roof Over Politicians' Heads? The fix is in. State and local government officials are benefiting from the dysfunction of low-income housing development projects, while taxpayers are left paying the tab. 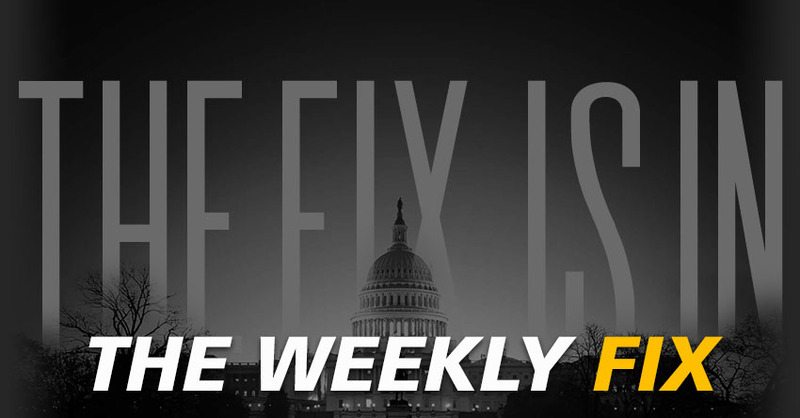 The Weekly Fix: Who Watches the Watchmen? The fix is in. Orange County, California is so corrupt, its anti-corruption joint task force has officially disbanded under suspicions of corruption. The fix is in. New York City has a pension problem. The Weekly Fix: Don't Steal. Politicians Don't Like Competitors. The fix is in. Allentown Mayor Ed Pawlowski has been convicted on 47 (out of 54) federal corruption charges. The Democrat mayor was accused of orchestrating a pay-to-play corruption scheme that involved bribery, conspiracy, attempted extortion, destroying evidence, lying to the FBI, and fraud.